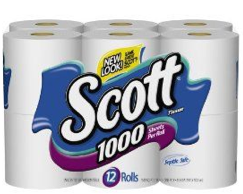 Price Chopper: $1.98 Total For 2 Colgate Sensitive Toothpastes + 2 Scott Toilet Paper 12 roll 1000s! Or buy the 2 Colgate Total Toothpaste Sensitive 4 oz. (shelf $5.99) plus any other 2 items included in the deal per the matchups w/ a $9.99 & $8.99 or higher shelf price (Viva Paper Towels, use $0.60/1 coupons, etc.) for this deal. *Just make sure your shelf price is $30 or higher as it may differ state to state or city to city. The Scott also rang up at $6.99 at my store. The good part is the shelf is $10.49, so when you buy 3 you get the $10 cat. Well, you get it if the Cat machine is working, that is. It wasn't when I went through the line so I had to re-do it at Customer Service. That's great your shelf price is higher and you don't have to mess around with the colgate - just wondering, what area are you in? Has anyone tried to roll the catalina into the same deal? I want to try but I would like to.get another cat back. This was at the store in Cooperstown. Everything is higher at that store. There are 3 other stores at about a 20-30 mile radius but this store usually has the highest prices. I can believe it in Copperstown, lol - at least this time it was a good thing! how do you get the buggies coupon? The deal w/ the $10 catalina is over but for the $3/1 huggies coupons they may be nla, I logged in and did not see the share option for $3/1 ones anymore, I only see the $1.50/1 ones.